You can participate in the conference FREE as a student volunteer. 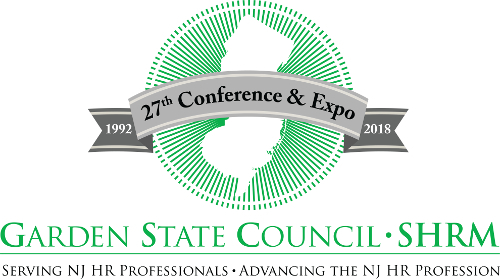 Attracting over 600 attendees to attend over 50 Breakout Sessions, 6 Mega Sessions, 2 Strategic Workshops and 1 Exhibition Hall in addition to other activities and events at the Annual Conference and Expo, the Garden State Council-SHRM Annual State Conference provides an excellent opportunity to network with HR professionals as well as with other students. Come and make the connections that can assist you in your career path! STUDENTS ARE ENCOURAGED TO BRING BUSINESS / NETWORKING CARDS! Utilize and develop your skills through a variety of volunteer opportunities. Volunteering may provide you the opportunity to attend speaker sessions as part of your volunteer assignment. You may also get to visit vendors in the exhibit hall and acquire information while you are performing other volunteer duties. Network and make connections with fellow students and HR professionals alike. Be a part of the team that makes a difference in the HR profession. Student volunteers get Free admission to the conference! This committee is responsible for obtaining all speakers and ensuring that everything is set up for their presentation. Student volunteers will set up rooms with evaluations, introduce speakers, conduct a headcount, collect evaluations and provide speaker support as required. Skills: Able to speak clearly to a group, customer service oriented, attention to detail. This committee handles all the logistical matters for the conference, such as room arrangements, luncheons and breaks, signage and equipment. Student volunteers will welcome attendees, provide general information and directions and assist with functions during breaks. Skills: Positive and outgoing demeanor, able to communicate and provide information. This committee fosters the benefits of the SHRM Foundation, provides information about the Foundation and encourages participants to donate to the Foundation. Student volunteers will provide information about the Foundation, generate interest and encourage donations. Skills: Able to initiate conversation and effectively communicate. This committee obtains sponsors for the conference, secures vendors to exhibit and manages the exhibit hall activities. Student volunteers will be assigned to assist vendor registration and respond to vendor needs as assigned. Skills: Attentive, good communicator and provide information. Upbeat and able to stand long hours. This committee schedules and manages the Sunday Business Education sessions. Student volunteers will sit outside classes, welcome participants, take attendance, answer questions and be available for assistance. Skills: Able to communicate information and able to quickly learn about process. This committee creates initiatives and events that enhance the conference participants’ experience. Student volunteers will be assigned to a variety of tasks, such as decorating for networking events, staffing Chapter Table, SHRM Foundation, Charity Table with Information booth. May also assist people at App Booth / Cyber / Computer Café and other events. Skills (depending on specific assignment): Follow directions easily, can lift up to 20 lbs., good communicator and technically savvy. This committee manages all pre-conference and conference registration and upon arrival at the conference provides participants with materials (such as badge, conference bag and brochure, etc.). Student volunteers will assist in preparing materials, and support the registration process. Skills: Flexibility in moving from one task to another, able to stand for a period of time, attention to detail and able to learn about the conference and communicate information. Hotel Accommodations: Accommodations for student volunteers are provided on Sunday, 10/14 and Monday, 10/15, based on the student's distance from the venue and the amount of time volunteered. There is a limited number of rooms available, and are double occupancy only. If you volunteer for the full conference (Sun. to Tues.), providing rooms are available, you will be given first priority for accommodations. If working Sun. and Mon. or Mon. and Tues., you will be given second consideration. You can request accommodations when you register to volunteer. As many requests as possible will be honored. If you make a request, you will be advised if it is accepted. NOTE: If you cancel your hotel room after October 2, 2018, you may incur charges for the room. Parking (with hotel accommodations): If you have a room at the Sheraton, you will park in the parking garage in the Sheraton Guest parking area at no fee. Daily Parking (not staying overnight): If you are only parking on a daily basis, you will park in the parking garage in the Convention parking area. You will receive a ticket as you enter. Please use the parking garage kiosk to pay for your parking - $15. Dress Code: You should dress business casual. No jeans, t-shirts, sneakers or work boots. As you may be doing a lot of walking, please wear comfortable shoes. Please wear business casual clothing. Bring a sweater, as the convention center may be chilly at times. Remember: how you present yourself will leave a lasting impression. Those not properly dressed, will not be permitted to volunteer. 12:00 PM – 1:00 PM Student Lunch – Pizza, soda and water will be provided to all students that attend the Student forum and Orientation. 1:00 PM – 5:30 PM Volunteer Assignments – A few students will be requested to start their assignments at 7:00 a.m., most students will have assignments that start after the Student Forum & Orientation. Only full day volunteers will be accepted to attend the Sunday Networking Reception. 5:30 PM – 7:30 PM Sunday Networking Reception – The GSC-SHRM Conference & Expo is hosting a Networking Reception for conference participants. Student volunteers are invited to attend but must indicate they can stay until 7:30 p.m. during the registration process. You must be a volunteer all day Sunday to attend the Sunday Networking Reception. STUDENTS ARE ENCOURAGED TO BRING BUSINESS/NETWORKING CARDS! 12:00 PM - 1:00 PM Student Luncheon & Presentation - All students are urged to join us for an educational and inspiring presentation and a sit-down lunch. 5:30 PM – 7:30 PM Monday Networking Session – There is a networking opportunity for students at the Monday night networking session. To attend, you must volunteer all day Monday and indicate that you will be available until 7:30 p.m. when you register. Not all volunteers that stay until 7:30 p.m. will have an assignment during the event, but must be available if needed. STUDENTS ARE ENCOURAGED TO BRING BUSINESS/NETWORKING CARDS! Volunteers are not required to stay for the networking receptions on Sunday andMonday and can leave by 5:30, however, you must indicate this when you register. We also offer half-day volunteering, however, only those volunteering for full days will be able to attend the networking sessions. Students cannot volunteer for the networking sessions only! During the registration process, you will be given the opportunity to indicate which assignment(s) you are most interested in supporting – view the types of assignments above. There is no guarantee what assignment you will be given prior to the conference. We often switch volunteer assignments at the conference to accommodate the various last-minute situations that arise. Check in for Students: Students must check in prior to the Forum which starts at 10 a.m. All students must check in at the Student Information Booth outside the conference hall. If you volunteer for multiple days, you must check in as soon as you arrive each day. Here you will receive your assignments. Student Forum: SHRM is hosting a Forum on Sunday from 10:00 a.m. to 11:00 a.m. Student volunteers are invited to attend and must register. You MUST indicate when registering if you will be attending the Sunday Forum and/or the Orientation. Orientation: We will be having a face-to-face orientation for all student volunteers from 11:00 a.m. to 12:00 p.m. Although not mandatory to attend the Sunday Orientation, it is highly recommended. Students will be given a brief training to prep for the various assignments. You will receive your schedule when you arrive at the conference. As the conference can be very fluid, your assignments may change at any time during the conference. You must report to the Student Information Booth before and after each assignment. To register, please proceed to the following registration page here. Use your confirmation number (which you will receive when you register) to log back into your registration. If you have problems, send an email to: students@gscshrm.org. If you make any modifications/cancellations after October 1st, you MUST send an email to students@gscshrm.org noting the change(s). If you have a question, comment or need assistance regarding volunteering as a student please reach out to us at students@gscshrm.org. Be sure to write 'Student Volunteer' in the subject line.